The Stiebel Eltron electric tankless water heater is a marvel of technology and engineering - overflowing with technology, yet packaged in an intelligent, simple design. It heats water entirely on demand, only when it is needed. When a hot water faucet is turned on and the water begins to flow, a sophisticated flow sensor detects that hot water is being demanded and turns the water heater on. Instantaneously, a series of sensors gather information about the flow rate of the water and the incoming water temperature. This information is sent to a microprocessor which calculates the amount of power needed to heat the water to the temperature set point. The water flows through the internal heating modules and exits the unit at the desired temperature. The start-up process takes a couple of seconds. A convenient thermostatic control on the front of the unit allows the homeowner to select an output temperature between 86 and 140F (30 to 60C) [Note: some models are designed for maximum output of 125F (52C)]. The sensors continue to monitor the water flow rate and incoming water temperature as long as the water is running. They constantly send data to the microprocessor so power to the heating elements can be modulated in accordance with changes in incoming flow rate and temperature. If, for instance, the flow rate increases because a second demand for hot water in the home is initiated, the unit will increase its power output to maintain a consistent and precise output temperature. The tankless water heater will remain on until the hot water faucet is closed. As soon as the flow sensor detects that water has stopped flowing, the power to the unit is completely turned off. All Stiebel Eltron Tankless Water Heater Tempra and Tempra Plus Series water heaters are manufactured in Germany in one of the world's only ISO-9001 certified tankless water heater manufacturing plants by a company that has been around since 1924! Please see the internal views of the Stiebel Eltron Tankless Water Heaters below for more details. All of the models utilize the same parts and technology, but have varying sizes and numbers of heating modules. 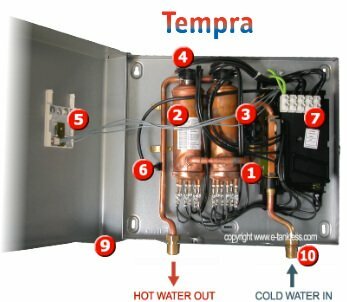 *Note: The Tempra 36 Plus and Tempra 29 Plus have 3 heating modules (not pictured). Sophisticated microprocessor-controlled electronics adjust the power output of the heating modules based on flow rate and incoming water temperature to precisely regulate the output water temp. The muscle of the system! A series of very high output heating modules (up to 3, depending on model) are used to heat the water as it passes through the heating chambers of the water heater. Each heating module features multiple heating elements. 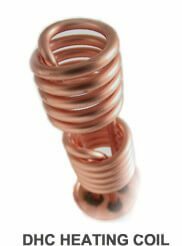 The heating chambers are manufactured with copper - no cheap plastics here! A sophisticated flow rate sensor delivers important data to the microprocessor on a continuous basis - this data is used by the microprocessor to calculate the power level of the heating modules that is necessary to heat the water to the set temperature. Safety first! Each heating chamber is protected by thermal limit switch, a back-up safety feature that will automatically turn off the heating module if a potentially unsafe output water temperature is reached. This reduces the risk of scalding injuries for children and the elderly, and protects the unit from damage if the microprocessor-based thermostatic control fails. Set it and forget it - use the simple dial control to raise or lower the temperature setting. Tempra Plus series are equipped with a digital temperature setting display. The temperature can be set at any level from 86F (30C) & 140F (60C) [up to 125F or 52C on Tempra 12, 15, and 20]. Working in conjunction with the flow sensor, a series of temperature sensors deliver important data to the microprocessor on a continuous basis so that the unit can acurately maintain the set output water temperature. Convenient terminal blocks are provided to ensure a quick, simple, and safe installation. Installation by a licensed electrician is highly recommended. Exclusive to Tempra Plus models, the dynamic Advanced Flow Control system will adjust the flow rate of the water if the microprocessor detects that the flow rate exceeds the capacity of the system. 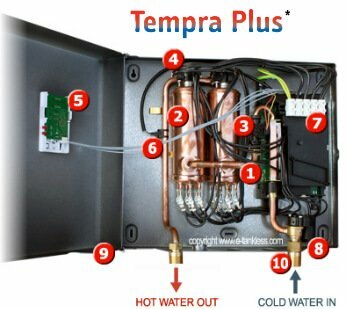 The result is the most precise temperature control of any tankless water heater on the market today! Ideal for applications where simultaneous hot water applications occassionally exceed normal model flow rate capacities. All Stiebel Eltron Tempra and Tempra Plus Series water heaters are housed in a sturdy steel case with built-in wall mounting brackets. Many competitors use flimsy light-gauge aluminum cases or even plastics. Tempra Plus and Tempra 24 models feature a convenient hinged case for easy access. The inlet water pipe includes a small screen filter that ensures that no debris is able to enter the system. This filter can be periodically cleaned for optimal flow performance.